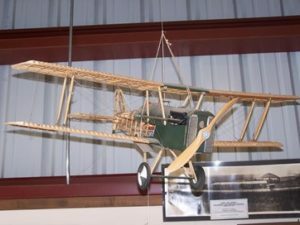 This model represents one of the early British fighter planes of World War I. 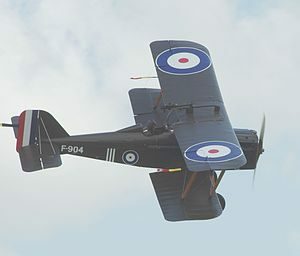 The Scout Experimental 5 (SE5), a single-seat biplane with dihedral wings, was designed by Henry Folland, John Kenworthy and Major Frank Godden of the Royal Aircraft Factory in Farnborough, England. 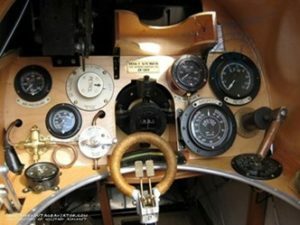 The airplane was designed around the 150 HP; water-cooled Hispano-Suiza 8 which was a V-8 engine. The engine provided excellent performance but was initially underdeveloped and unreliable. The first of three prototypes flew on November 22, 1916. The first two prototypes were lost in crashes, the first killing the chief test pilot at the Royal Aircraft Factory, Major F.W. Gooden on January 28, 1917, due to a weakness in the wing design. The SE5 was known in service as an exceptionally strong aircraft which could be dived at very high speed. Its square wings also gave it very good lateral control at low airspeeds. The SE5 was inherently stable making it an excellent gunnery platform in addition to being quite maneuverable. It was one of the fastest aircraft of the war at 138 MPH. While the SE5 was not extremely agile and effective in a dogfight, it was very easy to fly as well as being very safe, particularly for novice pilots. The SE5 had one synchronized .303-inch Vickers machine gun in addition to a wing-mounted Lewis gun on a Foster mounting which enabled the pilot to fire at an enemy aircraft from below as well as providing two guns firing forward.